↑ "Genus: Caesalpinia L." Germplasm Resources Information Network. United States Department of Agriculture. 2007-04-03. अभिगमन तिथि 2010-12-03. ↑ "Caesalpinia L." TROPICOS. Missouri Botanical Garden. अभिगमन तिथि 2009-10-19. 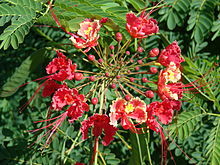 ↑ "Subordinate Taxa of Caesalpinia L.". TROPICOS. Missouri Botanical Garden. Retrieved 2009-10-19.